Protestors with the American Federation of Government Employees (AFGE) rally on the steps of the Supreme Court on January 10, 2018 to protest Ohio's so-called "voter purge" practices. In Hamilton County – and in large urban counties all over Ohio – Republicans and Democrats have been arguing about the practice of purging voter rolls ever since Republican Secretary of State Jon Husted became Ohio's chief election officer in 2011. That's when Husted and county election officials began removing hundreds of thousands of inactive voters from the rolls, claiming federal election law allowed the purge. 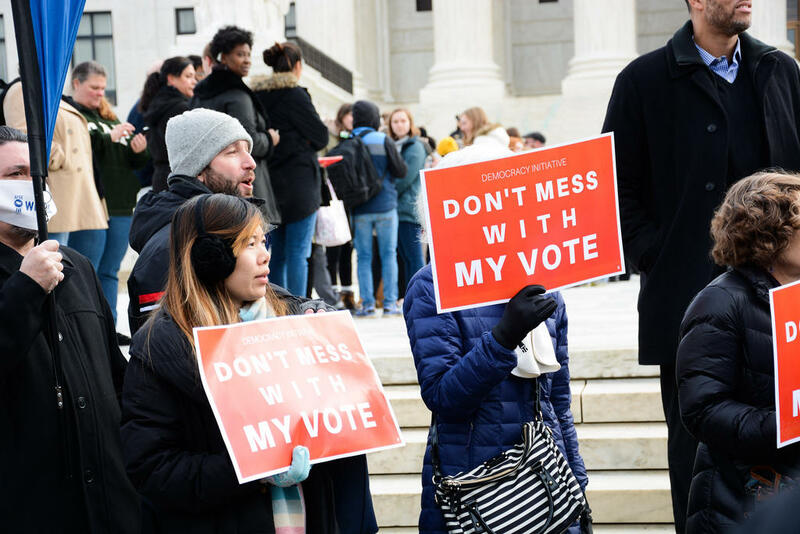 Monday, the U.S. Supreme Court, in a 5-4 vote, sided with Husted, saying Ohio did not violate federal laws by purging voters who don't vote and don't respond to mailed notice confirming their residency. The 5-4 U.S. Supreme Court vote may have settled the legal argument, but it did not settle the political argument that has been going on in Hamilton County for years and will, apparently, continue. "Yes, this was a 5-4 vote,'' said Tim Burke, the Democrat who chairs the Hamilton County Board of Elections. "But if the U.S. Senate had moved to confirm President Obama's nominee to the Supreme Court, the decision would have been 5-4 in the other direction." This decision is, without question, "a blow to voting rights,'' said Burke. "I don't know that it is a big enough blow to make a difference in most elections, although it might in some very close races,'' Burke said. "But it is a blow to voting rights. It fails to uphold the federal law. 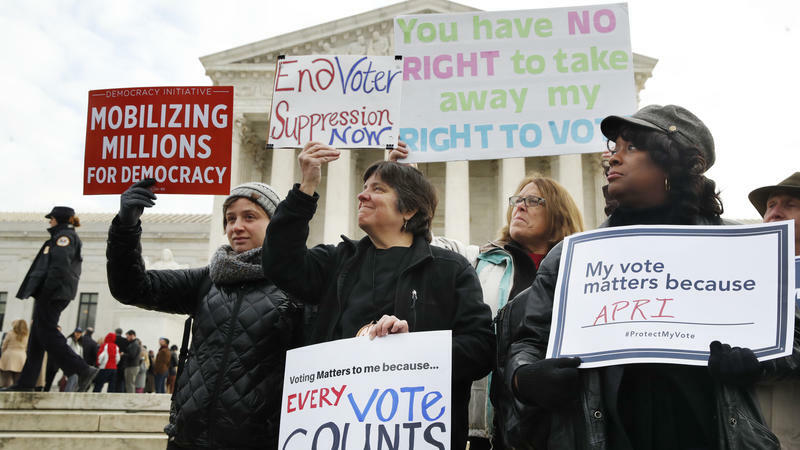 You shouldn't lose your voting rights because you have not used them for a period of years." "What the Supreme Court has done has allow one person – the Secretary of State – make up the rules on who can vote and who can not,'' Burke added. "And there is no question that most of the people who will be discouraged from voting now are poor minority voters." Alex Triantafilou, the Hamilton County Republican Party chairman and member of the county board of elections, said it is simply not true that Husted and other Republicans designed this purge to target the poor, the uneducated and mostly minority voters – most of whom vote Democratic in state elections. "All it does is encourage people to take seriously their right to vote,'' Triantafilou said. "We want people to vote. We don't want to remove people. "But I've seen time and time again where we will have people registered to vote from vacant lots and bad addresses,'' Triantafilou said. "These people should not be on the voting rolls. It affects the integrity of the election." And what is the practice that is used in Hamilton County and elsewhere around the state that has now been validated by the U.S. Supreme Court? Let's say you have been on the voting rolls for two years and had no voter activity in that period – either going to polls or simply signing a petition to allow a candidate or an issue on the ballot. The county board of elections would send you a "confirmation notice" – one that can be forwarded to your new address if you have moved. If you respond to the notice, you are put on "confirmation status." If, over the next four years, you fail to vote or respond to the notice, your voter registration is canceled. Across the United States, government officials try to maintain accurate voter rolls by removing people who have died or moved away. Now, the U.S. Supreme Court is taking up a case that examines whether some states, including Ohio, are aggressively purging voter rolls in a way that disenfranchises thousands of voters. The justices will decide how far states can go in purging their election databases.